It’s kind of the ideal scenario when the story and journey are situated in one of the most picturesque regions of New York State and the client is someone you enjoy and admire. Working with the Wild Center in conjunction with the Adirondack Regional Tourism Council, Warren County Tourism, the Saratoga Convention and Tourism Bureau , and I Love NY, on this project was exciting. The goal was to package a tour-based itinerary that would loop through Saratoga Springs, Lake George, Tupper Lake, and Lake Placid to be presented on an international stage. For us, this meant creating something that was not rooted in insider language or regional specificity. Consideration was given to translations and scalability to include other parts of the region at a future date. We presented half a dozen name options, each with its own spin. 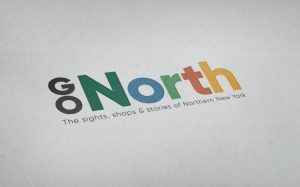 The concept that was selected, Go North was followed by the simple line: The sights, shops & stories of Northern New York. The itinerary was unveiled at the U.S. Travel Association‘s annual business conference, IPW, in Washington DC earlier this month. 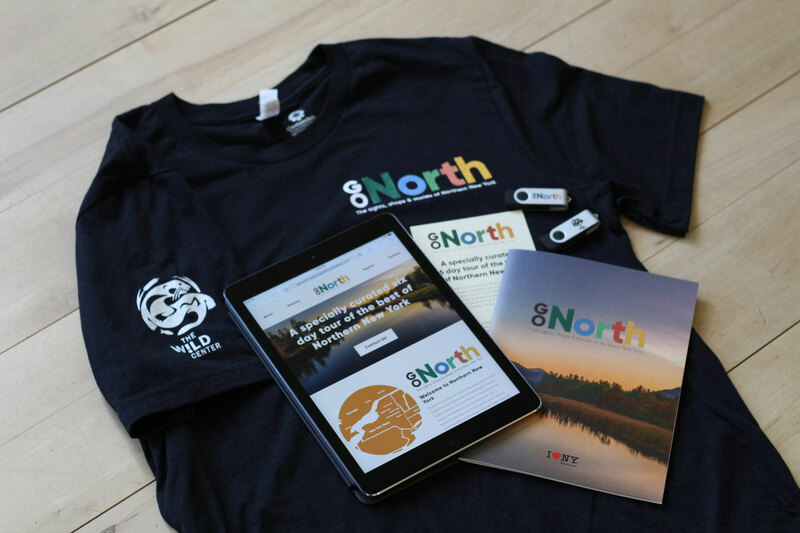 We created shirts to allow the team at the conference to represent Go North in both language and person. 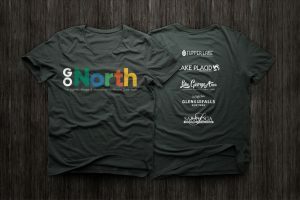 The itinerary branding on the front of the shirt, paired with the partner brands on the back, created the opportunity to spark more conversations with attendees. 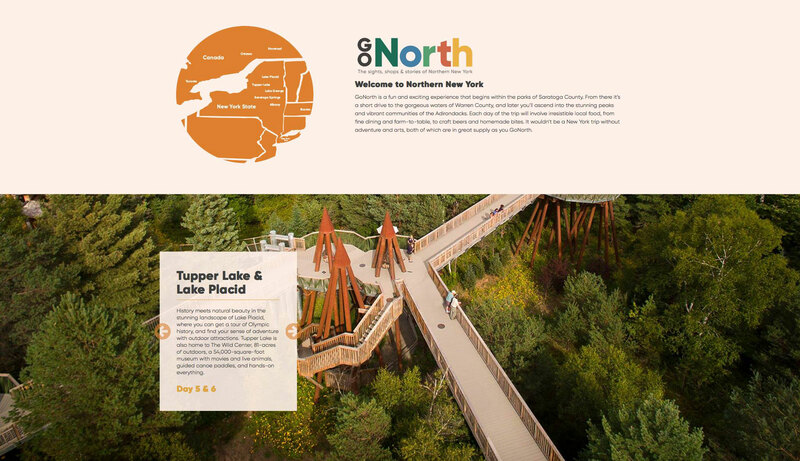 According to The Wild Center, the project aims to recruit new tour companies and travel agents to highlight Northern New York in their travel product offerings online, in print catalogs, and brochures. 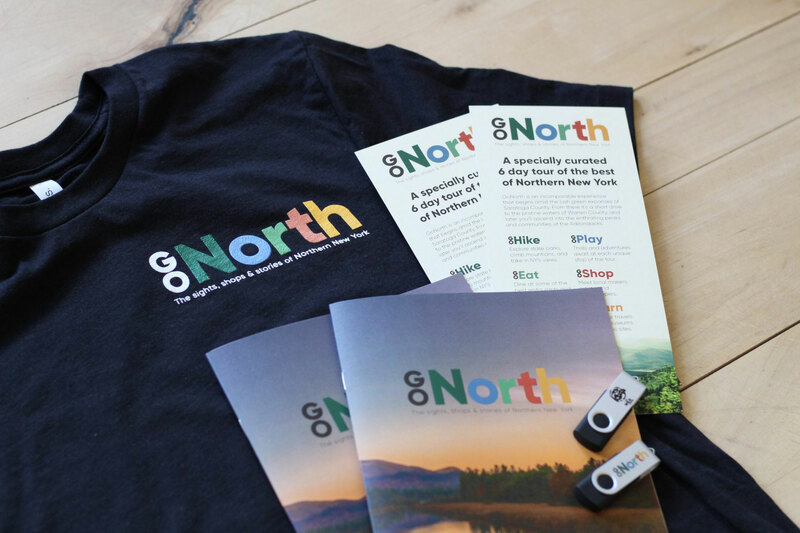 “We found that for the international market, the Adirondacks is a tourism ‘black hole.’ There just isn’t information out there to help draw people up and out of New York City,” said Patrick Murphy, Group Sales Coordinator at The Wild Center and one of the GoNorth team members. as well as the places they would experience, from waterfalls and fountains to casinos, museums, and shopping. Each A rack card and preloaded, branded flash drives made it simple to share information. The website for Go North, to support the print collateral, was developed by Mannix Marketing, who worked swiftly to ensure that the Go North was ready to Go Live for the conference.